If you want a better body then you need to consume protein. Protein is the one thing you can’t escape and if you try to then you are just escaping the body that you want. Consuming plenty of protein enriched foods daily to keep your body running properly. Most of us have known this since we were kids – probably from being told that protein will make us “big and strong”. In this article, you will learn what proteins are made of, where they come from, and why we should care about consuming enough. Protein is a macronutrient found in animal products, grains, dairy, vegetables, nuts, and seeds. Macronutrients provide calories which are the energy source of the body. Without proteins, we would not exist. Proteins are used in every single cell in our body and are made up of small units called amino acids. There are 22 amino acids that can be strung together to make up proteins; like the ones we eat, and the ones made by our bodies. Essential Amino Acids – These amino acids cannot be made by the body, they must be supplied by food. Nonessential Amino Acids – These amino acids are made by the body from essential amino acids that we consume or in the normal breakdown of proteins. Conditional Amino Acids – In times of illness and stress conditional amino acids are needed. All three of these amino acids are critical for building muscle mass, supporting neurological function, helping with digestion, and balancing hormones and mood. The sequence of amino acids gives each protein its “function” helping us to understand what the protein is and what it does for our bodies. This is all crazy, science talk that you probably don’t care much about, but it’s good to have a foundational understanding of how proteins function. Not all food proteins are created the same. This is important to keep in mind when you read a food label and see that it has 5g of protein. Different foods contain different proteins and more often than not they contain more than one protein. As mentioned before, amino acids can be arranged into many different sequences to create different proteins. For example, the sequence of amino acids that are used to create the protein in chicken is much different from the sequence of that of a soybean. When you consume Dairy, the proteins you take in are called casein and whey. Meat or fish or poultry proteins called collagen and myosin. Beans have proteins called legumins. Eggs contain a number of different proteins, including avidin and ovalbumin. Each of these proteins is made up of a sequence of amino acids making each of them unique in their own way. However, don’t worry because you aren’t expected to know exactly what type of protein you are consuming. Your body is cool and all, but it doesn’t always need to be treated like a science lab. 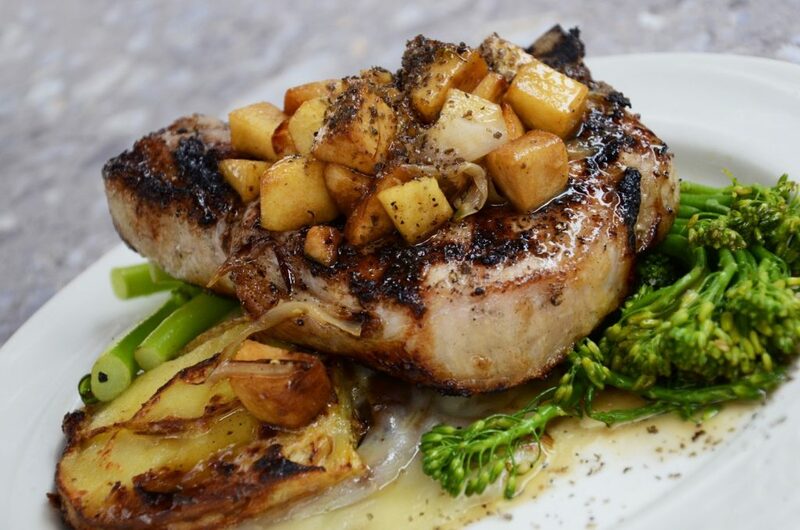 You see a delicious porkchop. I see 43g of protein. Your body uses the protein you eat to make different kinds of specialized proteins. Yes, you read that correctly. You consume one type of protein and your body decides to switch things up and turn it into another one. As you eat protein-rich foods, they travel through the digestive tract breaking back down into their individual form of amino acids. These amino acids are then absorbed into the bloodstream. At this point, your body will use these amino acids as building blocks to assemble over 50,000 different body proteins. Each of these proteins has a specific structure and function based on its arrangement of amino acids. For instance, our body uses protein to make hemoglobin, which is a part of red blood cells that carries oxygen to every part of our body. Bet you didn’t think that proteins would help to ensure your limbs fall off from lack of oxygen did you? Enzyme proteins are very specific. Each has a particular job it does and it does only that job. These enzymes break down food into usable material for the body. Antibodies are proteins that circulate in your blood and make up key components of a strong immune system. Contractile proteins are involved in muscle contraction and movement. Structural proteins such as collagen and elastin are found in our connective tissues wich provides support in our bodies. Hormone proteins coordinate bodily functions. One example is insulin which controls our blood sugar by managing the glucose into cells. Whether we eat soybeans or chicken there is no way to tell which amino acids came from what once they enter your blood stream. As long as we supply our bodies with the right nutrients in the form of amino acids, our bodies can create these important proteins. To ensure our bodies have a steady supply of amino acids it’s important to consume enough protein every day. You need to consume protein to ensure you have the right amount amino acids for your body to look like a superstar. Luckily for you, it’s not difficult to find foods that contain protein. Protein-rich food that we get from animals and animal products such as meat, fish, eggs and dairy usually score highly on their amino acid profile and are subsequently regarded as “high-quality proteins”. Proteins from these food sources supply all of the essential amino acids. Vegetables are also great sources of protein and amino acid. Achieving the right balance of nutrients to get the right proteins and amino acids are key. One of the challenges that vegetarians and vegans face when they first start on their journey is that they don’t consume enough protein. It’s definitely possible to get all the protein you need without eating meat, but you need to be aware of some good places you can get it from. Amaranth is a nutty brown seed that is packed with protein and can be added to yoghurt with fruit, cottage cheese or even a smoothie. Farro is a nutty grain that is a tad chewy but goes great with a poached egg and winter greens like chard, collards, rapini, and kale. Kamut is a firm grain that is great for stews, soups and even chili as it holds its shape. Quinoa is a small round seed that has a nutty flavor to it. Quinoa is so versatile that you can add it to salads, breakfast bars, tacos, or simply use it to replace rice in any dish. Spelt is a dark brown chewy grain which pairs great with salads or even veggie burgers. I, however, love using spelt flour to make homemade pizza crust. Check out the recipe here! Wild Rice is another protein packed grain which I love to pair with roasted vegetables. And even if you aren’t a vegetarian you can add animal protein to any of these combinations for an amazing meal. From athletes to women and men we all need a different level of protein. This is based on your body weight, gender, age, and level of activity. Women who are pregnant or nursing should consume more than the daily recommended protein intake. You will also need extra protein if you are physically active playing sports, lifting weights and running. The amount of protein our bodies need depends on how demanding, how intense and how frequent our training is. Quick tip the recommended daily intake is 0.8-1.5 grams of protein per pound of body weight. A Calories Counter wrote a related article called How Much Protein Per Day To Build Muscle, Lose Fat & Be Healthy? In this article, A Calories Counter did an amazing job breaking down how to calculate your protein intake based on not just your weight but also your activity level. If you are interested in tracking your protein no matter what phase of life you are in the A Calorie Counter graph below will guide you through the process. Average healthy sedentary adult (male or female) that does NOT work out or have any related goals. This is just what I consider to be a good minimum daily protein intake for general health/function. 0.5-0.7 grams of protein per pound of body weight. 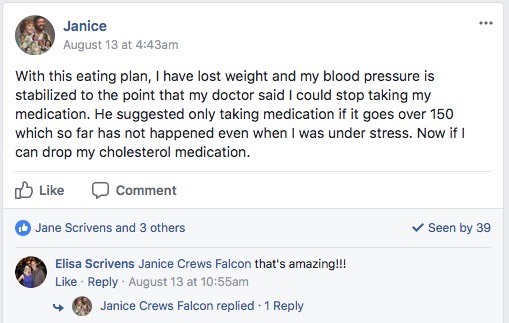 Average healthy adult (male or female) that IS doing some form of exercise regularly or IS trying to improve their body (lose fat, build muscle, etc.). This is the minimum I’d recommend in this case. 0.8-1 grams of protein per pound of body weight. 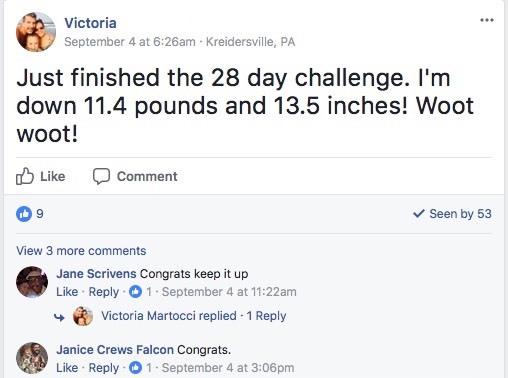 Average healthy adult FEMALE whose primary goal is building muscle, getting “toned,” maintaining muscle while losing fat, increasing strength or improving performance. 1-1.2 grams of protein per pound of body weight. Average healthy adult MALE whose primary goal is building muscle, getting “toned,” maintaining muscle while losing fat, increasing strength or improving performance. 1-1.5 grams of protein per pound of body weight. In order to figure out how much protein our bodies need each and every day, simply multiply your current body weight by the recommended protein intake that fits your physical situation and goals. For example, I’m a healthy female weighing 138lbs who is striving to gain muscle while shedding some fat. In my case, I would multiply 138 by 1-1.2 to get my daily protein intake of 138-165.6 grams. Knowing exactly how much protein you are taking in daily will help you keep your body balanced so it functions properly. For example, if you notice you aren’t consuming enough protein while tracking your daily protein intake you could throw your body out of whack. Also, if your body consistently has a shortage of protein, the only option your body will have is to break down the proteins within itself to equipped it with the amino acids it needs to produce the necessary body proteins. You need to consume the appropriate amount of amino acids coming in from your diet to keep the process of building up and breaking down in check. On the other hand, what would happen if you over compensate and consume more protein? Well, consuming excessive amounts of protein can actually do more harm to your health than you think. As you can see whether you’re a meat eater or not, everyone needs protein in their diet. Consuming a variety of proteins from meats, dairy, vegetables, beans, nuts, and seeds can keep your body well balanced and functioning properly. So, now that you understand why protein is so crucial to your health, the only thing left to do is to keep on munching! 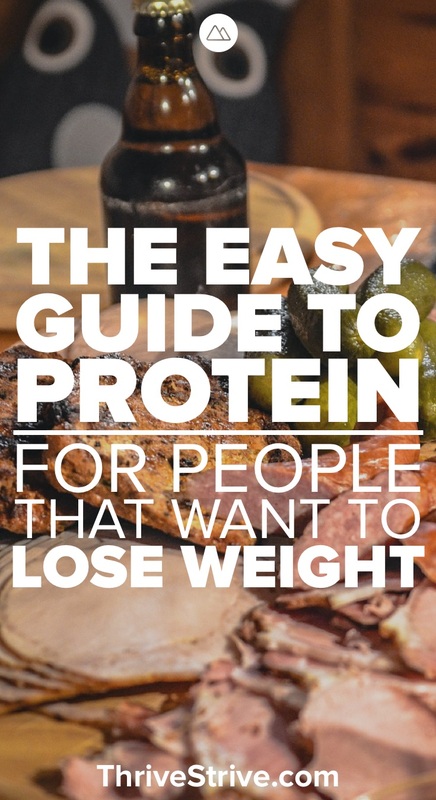 Enjoyed Understanding Protein: A Guide for People That Want to Lose Weight? Share it with your friends so they to can follow the Thrive/Strive journey.